The St. Regis Bora Bora Resort certainly lives up to travelers' expectations that the brand is all about the ultimate in good taste and luxury: The property, which opened in 2006, features not only one of Bora Bora's best beaches and its largest overwater bungalows, but also Lagoon, the region's only restaurant by world-renowned Chef Jean-Georges Vongerichten. While the St. Regis hits all the right notes when it comes to five-star amenities (including butler service), it doesn't quite exude the authentic Polynesian ambiance and cheery "ia ora na" (the local greeting) ease of some of its competitors. Aside from the thatched roofs, its luxurious bungalows feature décor that's more contemporary than culture-centric, and its lobby, spa and other main buildings have white coral and stone walls with polished marble floors and formal, European-style furnishings. Don't get me wrong: The effect is quite beautiful, but at times a tad out of sync with Bora Bora's natural surroundings. Even so, guests who want to be pampered in high style will find much to love about this expansive and lushly landscaped resort. Plus, it's fun to be able to tell your friends you stayed at the property that doubled as the "Eden Resort" in the 2008 Vince Vaughn-Jon Favreau comedy "Couples Retreat,"; one the top movies filmed in the South Pacific. 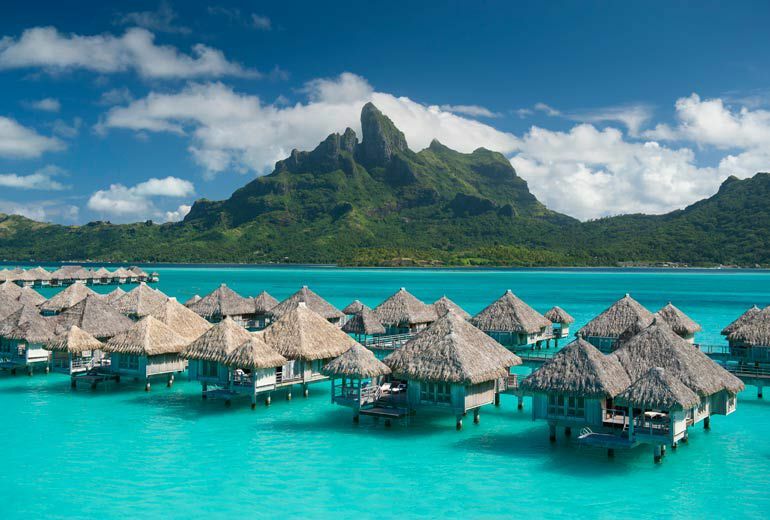 At 1,550 square feet, Overwater One-Bedroom Villas (there are eight, plus 24 Superior Overwater One-Bedroom Villas), with their dark wood floors and louvered wooden shades, offer ample space to relax. Divided into separate living and sleeping areas, with a super-spacious bathroom featuring a huge tub and open shower located behind the bedroom, each has a private terrace and dining gazebo with lagoon views. One step up, the 32 Deluxe Overwater One-Bedroom Villas are the same size but offer Mt. Otemanu views, while the eight Premier Overwater One-Bedroom Villas, at 1,905 square feet, add a daybed and whirlpool on the deck. For added privacy, choose one of the four Pool Beach One-Bedroom Villas (1,636 square feet), seven Oceanfront One-Bedroom Pool Villas (2,702 square feet) or two Royal Oceanfront Two-Bedroom Pool Villas (2,852 square feet), each with beach access, a private outdoor plunge pool and garden. The St. Regis isn't shy about the celebrities who have stayed here, mainly in its two top villa categories: Carrie Underwood and husband Mike Fisher dodged paparazzi in one of the five Royal Overwater Two-Bedroom Pool Villas, which at 3,455 square feet have a large private pool and top lagoon views (but not a ton of privacy). To keep inquiring minds at bay, both Nicole Kidman and Keith Urban and Eva Longoria and Tony Parker (who have since filed for divorce) booked the aptly named Royal Estate, an extremely private, three-bedroom enclave that at 13,000 square feet pulls out all the luxury stops - including a private spa, sauna, hammam, whirlpool and beach. It's not enough just to have five-star accommodations—the caliber of dining options needs to be top-grade, too. At the St. Regis, guests have four dining options, from casual to gourmet. Everyone who stays here should definitely splurge at least once on a dinner at Lagoon, the gastronomic restaurant run by Vongerichten and featuring an internationally inspired menu based on both classic French (foie gras, duck breast) and Polynesian (cracker-crusted tuna, deep-sea barracuda) ingredients. If the night is clear, order a specialty cocktail (such as the fragrant Ginger Margarita) and dine outside on the deck for stunning lagoon and star views. Another top option is the intimate Sushi Take Restaurant (closed Sundays), Bora Bora's first sushi and sake emporium, for creative takes on classic Japanese favorites. For lunchtime fun, swim up to a stool at the Aparima poolside bar, where burgers, club sandwiches and pizzas - paired with an icy Hinano beer - are on offer all afternoon (but will set you back about $30 each). The fourth restaurant, Te Pahu, specializes in local Polynesian cuisine and serves three meals a day. It's easy to keep active and yet refreshed on this 44-acre property, which features two pools: the main pool adjacent to the beach and an intimate Oasis Pool nestled on one of the motus lined with bungalows. But the prime locale for cooling off while having fun is the Lagoonarium, a large, calm salt-water lagoon stocked with fish and ideal for even inexperienced snorkelers, which is accessed via several wooden docks with ladders. The resort also features complimentary bikes, tennis courts and a fitness center, as well as access to Jet Skis and other lagoon excursions at an added cost. To keep connected, St. Regis offers resort-wide WiFi at a charge of about $30 a day. While not the largest or most visually impressive spa on the island, the resorts' Miri Miri Spa, set away from everything at the far edge of the Lagoonarium, does offer a wonderfully revitalizing, sigh-inducing Polynesian massage; afterward, you can relax on a chaise or shaded hammock overlooking tranquil blue water as you contemplate all the ways to indulge yourself at this haven of all things luxurious. Check prices for your stay at the St. Regis Bora Bora Resort on TripAdvisor.